मी आज खूप खुश आहे आणि याला कारण म्हणजे गुगलनी नवा टायपिंग चा फंडा विंडोज वर उपलब्ध करून दिला आहे. Transliteration च्या माध्यमातून आणि त्याला शब्दासंग्रहाची जोड देऊन आपण लिहीत असलेल्या नेहमीच्या रोमन लिपीतल्या मराठी शब्दाना आता देवनागरी लिपीची जोड मिळाली आहे. आता मला मराठी भाषेत लिहिणे खुपच सोपे झाले आहे मला खरेतर इन् स्क्रिप्ट कीबोर्ड येत होता आणि त्यावर माझा स्पीड पण चांगला आहे. पण रोज इंग्रजी मध्ये टाईप केल्याने त्यात फार काही वाढ होत नव्हती. माझी आहे तीच सवय कायम ठेऊन त्याला तंत्रज्ञानाची जोड देऊन गुगल ने मराठी आणि इतर आणखी काही भारतीय भाषा भगिनींना जागतिक नकाशावर आपला ठसा उमटवणे आणखी सोपे केले आहे. मायक्रोसॉफ्ट असाच काही प्रयत्न अरेबिक भाषेकरिता करत आहे. आणि मला खात्री आहे की या शर्यतीत ते मागे राहणार नाहीत. स्पर्धा कायमच तुम्हाला काहीतरी नवीन आणि चांगले करण्यास भाग पाडते. आणि त्याचा फायदा जर जगाला होत असेल तर त्या बद्दल या अमेरिकी कंपन्याना धन्यवादच दिले पाहिजेत. आज या कंपन्यात हजारो भारतीय काम करत आहेत आणि त्यामुळेच आपली आणि आपल्या भाषांची दखल घेतली जात आहे. या साऱ्याचा फायदा आपल्या देशातील असंख्य लोकांना, ज्यांना इंग्रजी भाषा येत नाही किंवा जुजबी येते, अशांना संगणक साक्षर होण्याकरता नक्कीच होईल आणि या कारणाने भारताची प्रगती आणखी कैक पटीनी वेगात होईल असे मला ठामपणे वाटते. आपणालाही जर माझ्याप्रमाणे मराठीत टाईप करायचे असेल तर गुगल च्या या पानावर जा. आणि हे सोफ्टवेअर डाउनलोड करण्याकरता या पानावर जा. Puneri Pundit voted in the Maharashtra Assembly elections 2009 but unfortunately 50% of Puneris did not cast their votes leaving me wondering as to the reasons behind this. One thing I feel is that when the government declares holiday and that to on a day like Tuesday, lot of people from metros jump on this opportunity and take leaves on Monday to enjoy a long weekend and desired break from work. So the measure from EC to ensure high voting percentage did not work. On the other hand it does bring in a doubt in my mind that was it an intentional move from government? The MNS support figures from urban areas were worrying the ruling party as well as opposition and most of these voters were new and young voters who would typically go on long weekends on any such opportunity. Whatever may be the reason, 50% of the urban voters said they are not interested in voting. Now if we look at the share of votes by all winning parties, they typically get about 30-35 % of the total votes which means about 15-18% of total voters. Does it really make sense to declare these folks are winners in the election? How should we reduce that fractured voting and ensure that the ruling party really represents majority of us? One idea comes to my mind is that the losing candidates should declare support to top candidates from any constituency until the winner gets 50% of the casted votes at least. This will then show the inclination of the small time players in the field and also let people know as to who was supporting them really from behind. Another way I feel is that the elections should be conducted on Sundays. The reason I believe they conduct them on weekdays is to allow candidates connect with voters on the weekend. But by conducting the voting on Sunday we can really get a better turn out and hence better representation. I am happy that since I have voted, I can talk about the government, politics and other issues where I feel we deserve better. Well you will ask me what is connection between Prabhu Ramchandra & Raj Thakre. Appearantly there is nothing that you can find quickly. But little bit of reference to history and you will find it quickly. Wasn’t Prabhuji the prince of today’s bhaiyyas? He was the first UPite to come to Maharashtra. Who were residents of Maharashtra & may be Karnataka then? In Dandakaranya, it was land of rishis and munis and the rest was wanarraj. Sugreev was fighting with his brother Wali even in that time. Fortunately the issue of Bhaiyyas was not that hot at that time. Hardly anyone from north used to come down under. So there was no Raj Thakre in that time. Times have really changed. From the prince of Ayodhya, now you will find the poor common people coming here. The MNS equates them to monkeys. Tries to shoo them away. Ram is now worshiped in Maharashtra as well as all southern states of India. Hanuman from this area is worshiped in North. So much so the monkeys are treated as avatars of Hanuman and they have become a big time menace in Delhi. So the men are being compared to monkeys and monkeys are being compared to God. Times have not really changed. Brothers in Maharashtra still fight with each other. Earlier it was wanar princes now the human beings. To kill his own brother Sugreev took help of Ram. To win elections in this times, vote banks of North Indians are being created. Kingdom gaya bhadme. Muze meri gaddhi chahiye. So the Maharashtrians can really claim the authenticity/ originality of there genes and call themselves as locals and sons of this soil as long as they can keep fighting with each other. North Indians do not worry. Raj will never get majority. Our own brothers will ensure that. You are most welcome. Note: Please take this entire writing on a lighter note. I personally do not intent to offend any of our Gods. They are as much as mine as yours. I do not intent to demean the human beings or any race or people from any region. But just give a different direction to look at our history. With the Commonwealth Youth Games 2008 Pune Municipal Corporation got ample funds to improve the roads and infrastructure. There are lot of traffic signs everywhere, streets are beautified, reflectors, lane stripes are now clearly visible. The city has a refreshing look. All good work so far. Now the question is, for how long will this last? Does PMC has enough funds to maintain this? Or will it be the same story again within few months? We in India have habit of painting our homes on festive occasions like Diwali. Later all that enthusiasm goes down and we keep pushing the maintenance to lower priority till the next festive season. Apart from PMC’s responsibility, do the citizens of Pune feel themselves responsible in maintaining the infrastructure that is also a big question. This responsibility includes not to misuse, keep watch on PMC and it’s contractors, not allowing general public to misuse. All this expense has been done out of tax payers pockets and that means everyone in the country. Not just income tax payers. Everyone pays taxes indirectly. Let’s make all, who are part of the city or visiting the city, aware that it is in our interest to maintain this infrastructure so that the income is spent to improve/ add new infrastructure and not just maintain the existing. India has no doubt one of the most craziest people in the world. Just a few days back one person walking on Pune roads saw two young men riding on a bike dropping a packet on the sides of the road. The bike apparently did not have a license plate. Cautious due to recent bomb blast modus operandi of the terrorist, he alerted the police. They in turn called the anti-terrorist squad(ATS). The story is normal till this point. In most of the Hollywood movies we have seen this hundred times that one of the bad fellas or a cop fires gun and the crowd in the public place starts running around, scared to get killed. We never thought this is wrong. This is normal human reaction. But here is what sets India apart from the rest of the world. When the Bomb Difusal guys arrived at the scene in Pune, instead of running away from the place to save their lives, there was a huge crowd to see how they guys defuse the bomb. Really… this is not a fantasy. People actually did not think twice before gathering at that place. Have you ever seen such people elsewhere? However, as the mob expected the so called bomb turned out to be leftovers from some student’s kitchen. San Francisco when seen from the top looks so well planned. The town planning is very well defined in blocks. Most of the blocks are pretty rectangular and the houses within the block are quite similar to each other and give a planned look to the city. Having ample land makes most of the houses about 2-3 storey tall. Even the office buildings are all spread across. I have been in sub-urban and rural areas of South Africa and now I am seeing various suburbs in California. What struck me most was that most of these houses are just like our houses in rural India. Sloping roofs, garden in front or back, car parking etc. But what makes them far more attractive and high quality is the overall discipline, neatness, cleanliness and detailing in the finishing touches. All houses have a well maintained garden/ lawn around. Very well defined parking area, all compound walls are well constructed and complete. You will hardly find broken walls. Also the people here can easily manage with a nominal boundary. Go to the crowded areas, on the roads, between buildings you will find that just a nominal barrier is enough to maintain discipline. Rarely you will find people crossing roads at will and at any place. It is in nature to cross the road at junction or at zebra crossings. This is a diagonally opposite of Pune, where even a 4 feet road divider is not a guarantee that people will not cross the road over it. I keep on wondering, why is it impossible for us in India to show this discipline? Why are not our rural houses so complete till final detail? My website (http://hemantsathe.net) is currently offline as I am finding new hosting service provider. My earlier provider was too costly for the kind of traffic I had. I have started another blog for the technology and management related posts. 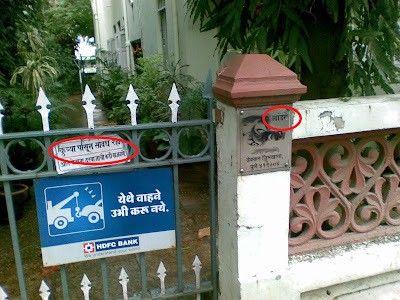 This blog I want to keep limited to Puneri stuff. Do visit http://techpm.blogspot.com. I am missing comments on my posts. As much as I like to express my views, I need reader’s feedback to keep myself going. Please make it a point to comment if you liked or disliked the posts. Pune University square is one of the busiest crossings in Pune. It connects at least 3-4 major areas – Pune University, Aundh, Pashan, Senapati Bapat Road and has few major landmarks around – again the univ, Chatushringi temple, Raj bhavan, Rural Police offices, schools like Loyola’s & St. Joseph’s. During the rush hours this area is completely packed. Until few days back, the flyover work in this area was creating more chaos than what it was trying to solve. But people tolerated all this because the flyover was going to be complete soon and the speed of the traffic was going to increase. There is a speed limit of 40km/hr in this area. You spend so much to speed up the traffic in the area and then what do you finally do? Impose speed limit! Wow! what a way to solve a problem!